Every year thousands of online businesses fail. None of them begin with the idea they’ll fail, in fact they have high hopes of success, but they fail all the same. One of the main reasons for the high failure rate is an over reliance on one marketing channel: the Internet. Marketing isn’t about using one medium. It’s about getting and keeping customers. Yes, Internet marketing can help you can do that but only if you use it in conjunction with other tactical tools. In addition there are thousands of potential customers that are extremely cautious about placing important business or buying an expensive item from an unknown online vendor. That’s one of the reasons why, in order to succeed, EVERY online company must have brochures and other forms of printed sales literature to hand out to customers and prospects. People expect a real company to have printed sales literature. It’s easy to afford spending $60 on business cards, letterhead etc. and call yourself a corporation. But if you want to look like you mean business, you need a brochure of some sort. People want printed material to take home and read at their leisure. Yes, you can direct them to your Web site, but a brochure adds a personal touch, tells your prospect what the product or service can do for them and why they should buy from you. Brochures also support other advertising, direct mail, online promotions, and can be used as a sales tool by distributors. In short, a good brochure sells. Here are 12 tips on writing a brochure that will support your online marketing efforts, and increase your sales. You must write your brochure or leaflet from the reader’s point of view. That means the information must unfold in the right order. Begin by analyzing what your reader wants to know. An easy way to do this is by assessing the order in which your reader’s questions will flow. For example, imagine you own a medical spa facility offering Botox and other anti-aging treatments. You are interested in encouraging your readers to make an appointment for a consultation and/or schedule a treatment. Now, given the nature of your business, your reader will have a lot of questions they’ll want answered before they’ll consider making an appointment. Your brochure should answer their questions in a logical sequence following the reader s train of thought. A good way to organize your points is to write down the questions you think a potential customer might have, and the answers your brochure might supply. The first page your reader will see is the front cover. Get it wrong and you’ve as good as lost the sale. Don t make the common mistake of couching your services in technical jargon. Think benefits or thought-provoking statements that motivate the reader to pick up the brochure and open it. Add a flash that tells the reader there’s something inside that will interest them an exclusive invitation, a free report, special discount or advance notice of sales. Don’t be tempted to put only your company logo or product name on the front. It won’t work. In brochures of eight pages or more, a list of contents is useful. Make your list in bold and separate it from the rest of your text. Use the contents to sell the brochure. Don’t use mind-numbing words like “Introduction” or “Model No A848DHGT”. Pick out your most important sales point and use that in your heading. To help you describe your product draw up a list of product features (facts about your product) and add the words “which means that…” after each point. For example, “The cake is made from an original recipe, which means that…it tastes better.” Or, “The car has a 300 horse-power engine, which means that…it goes faster.” Remember that the purchaser of your product is not always the user so there may be more than one benefit for each feature. Putting helpful information in your brochure will encourage the reader to keep it, refer to it often or pass it on to other people. If you’re selling paint you can provide hints on color schemes, painting how-to information, tips from the pros etc. If you’re selling skin care products you can give your readers tips on how to combat pimples, dry skin, fine lines and wrinkles. Who says a brochure has to be A4? Selling sandwiches? You can design a brochure in the shape of a sandwich. Season tickets to soccer matches? Design it in the shape of a soccer ball. 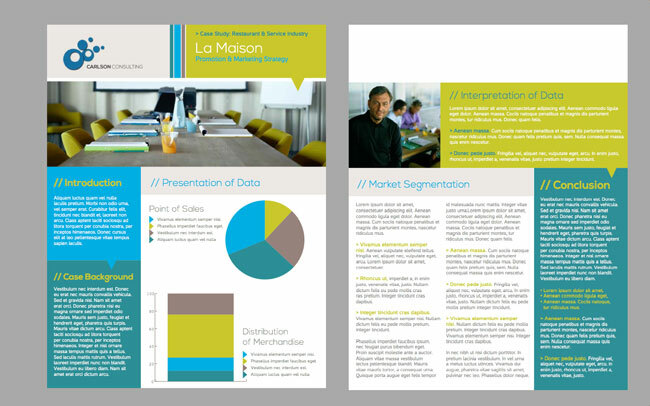 Using your imagination when designing your brochure can produce better than average results. According to Direct Magazine, a recent mailing by CSi, a company that conducts customer satisfaction surveys for automobile insurance firms and repair shops, got a 15% response rate with a brochure delivered in a 32-ounce squeeze sport water bottle. The headline read, Thirsty for more repair orders? Try tall and slim, square, oblong. Whatever you like. The only limitation is your imagination, and, of course, your budget. An experienced speaker talking to a large audience will pick out a face in the crowd, and talk to that face. This connection with one person allows the speaker to make his talk more personal than if he were merely addressing a mass of faces. In a similar fashion, the words in your brochure should use this technique and zero in on one imaginary single person. Why? Because writing in a direct I m-talking-only-to-you style will increase response. Don’t let your brochure sound aloof. Let your reader share your feelings. There’s no reason why a brochure about a wood burning stove has to go into the ins and outs of how the stove works. Tell your reader about rain swept winter evenings and snow-bound afternoons. Let your words show them how warm and snug and they’ll be when they purchase one of your stoves. Remember, not everyone wants to be educated on every aspect of your product or service. Nor does everyone want to know the manufacturing details of your widget. Don’t waste their time telling them about things that don’t convey a benefit. Yawn…This is the bar room bore in print. Instead of telling you how the company can help solve your problems, it’s more interested in telling you about itself. Every brochure should be organized so the reader can flip through the pages and easily find what they want. Provide clear signposts or headlines throughout the brochure and make sure each one says: Hey, pay attention to me! Regardless of how you organize your brochure, there’s only one way to end it. Ask for action. If you want your reader to respond include an 800 number, reply card, or some form of response mechanism. In fact, to increase your brochure’s selling power you should include your offer and a response mechanism on every page. Marketing isn't about using one medium. In order to succeed, EVERY online company must have brochures and other forms of printed sales literature to hand out to customers and prospects.